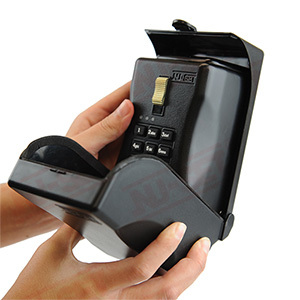 The NuSet Model 7060-3 Smart Box is an electronic lock box that brings you the most affordable access control system for stand alone use. This lock box for keys is an excellent solution for real estate agents, facility managers, security officers or anyone else who has keys or access cards that need to be secured and their access monitored. The lock box is ideal for controlling and monitoring access to computer rooms, stock rooms, file cabinets, real estate property, etc. Business owners can use the Smart-Box to grant authorized employees access to restricted areas while tracking date and time of entry for each authorized user. Facility managers can use the Smart-Box to control and monitor access to sensitive resources or shared equipment. This electronic lock box can even be stored inside a desk drawer as a small safe. 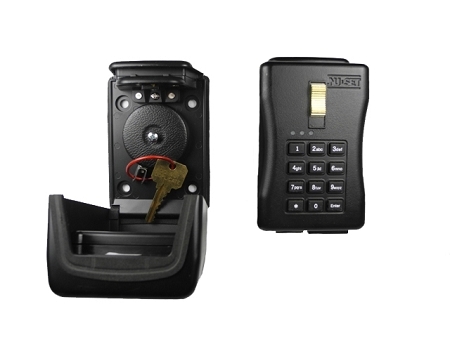 For even more security, we also offer the Model 7060-3 KR, a customized version of the Model 7060-3 that incorporates a key retractor and optional tamper proof cable key ring. Each Smart Box comes with its software on a USB device that is easily installed on your computer. The software lets you assign up to 500 unique access codes and customize the access parameters of each code. Once the data is entered into the software, it programming is loaded to the USB device for transfer to the lockbox. By periodically transferring the lockbox log to the USB device, the software can keep track of all activities at the lockbox and allow you to review access information by date, time and code. The detailed access log keeps you informed should anyone try to tamper with your lockbox or access its contents without authorization.